No wind in the morning so we postponed onshore for 2 hours and then went out to catch the sea breeze. The Braun family ran 5 races for us and we had 8 standard rigs and 4 radials out racing. Generally I had good speed all around the course, but wasn’t as clean in transitions as I could have been. 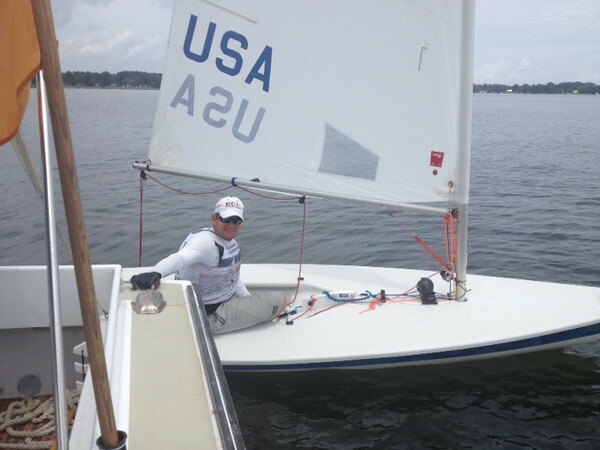 Charlie Brewer sailed a superb day and wasn’t able to be caught taking 5 bullets. I settled for 2nd scrambling to stay ahead of Rob W and Csilla Gal. Big thanks to Matt Braun and Doug Bendura for heading up the RC. 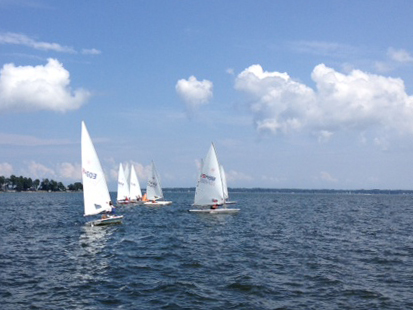 We had a shifty day of racing at Fishing Bay Yacht Club for the Laser Summer Regatta. With light winds out of the south and a sea breeze trying to come in and take it a little more east there were sometimes swings of up to 50-70 degrees – yet it would keep stabilizing around 170. We had a 10 boat line and a rather ‘competitive’ length line for that number of boats. 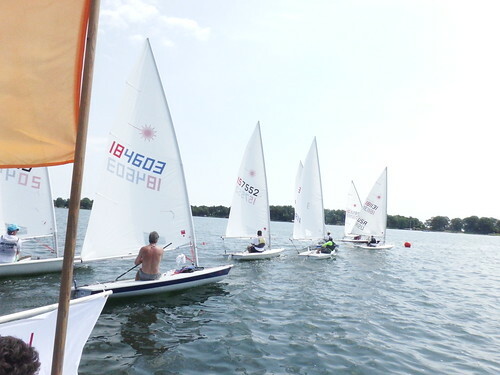 I had about 1 good start in 5 races and in the others I was either behind boats, couldn’t accelerate, over early or fouling people and having to stop and turn before I sailed the course. That being said – picking the shifts and staying in pressure was key and with the shifts as big as they were – passing lanes were plenty. It was fun racing with Steve, Brad, Alain, Mike and everyone else who came out. Thanks Mark Stephens and crew for doing RC and Steve Q for the great social following racing. 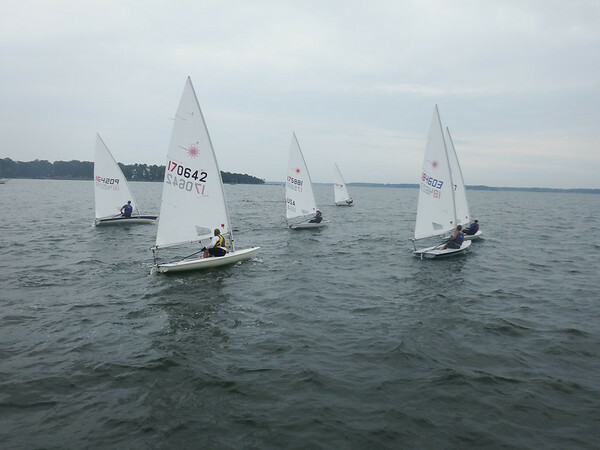 We started the day with steady rain and plenty of it and hoping for a clearing to enable us to get some racing in for Fishing Bay Yacht Club‘s Summer Laser Regatta. After watching the weather for a bit we were going to have a break around mid-day so we made the call to race right off the dock in the 8-10 SSW breeze we had. We got off to an on time start with 11 boats on the line. The racing was fun and competitive. The wind was shifty. A few quick sprinkles rolled over the course before clearing later in the day. Alex Jacob did a masterful job in the first 4 races and stretched out in all of them to take bullets. Robert Suhay, Len Guenther, myself, Mike Moore, Brad Squires and James Jacob all sailed in a pack just behind with any one of us challenging for 2-6 in every race. 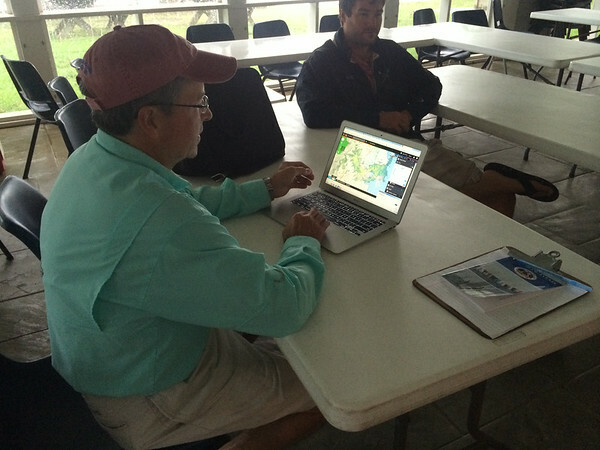 PRO Lud Kimbrough and his crew of Eliza Strickland, Anna Matchett, Clay Harris, Katherine Harris, Miles Kimbrough & Just Wilton did a great job being out there under threat of storms and adjusting the course as the wind flaked back and forth. The course lengths were great allowing us to stretch out just enough, but still keeping the starts and the races close. 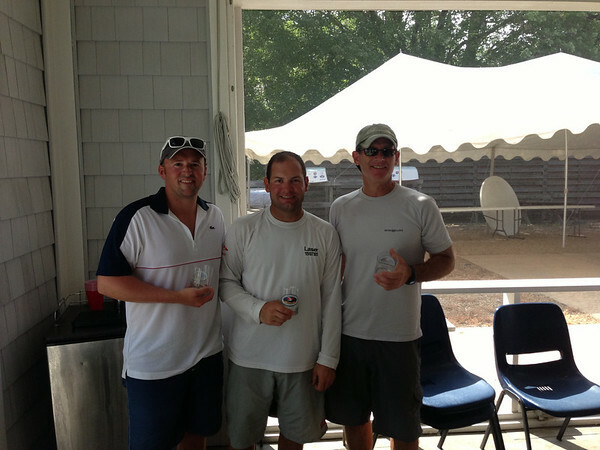 My day and my first race with my new boat – No Quarter – was a bit of a mixed bag. I had the boat together well enough, but my lack of time in the boat this year clearly showed. I stayed with the pack and had some great legs, but wasn’t able to put a whole race together. 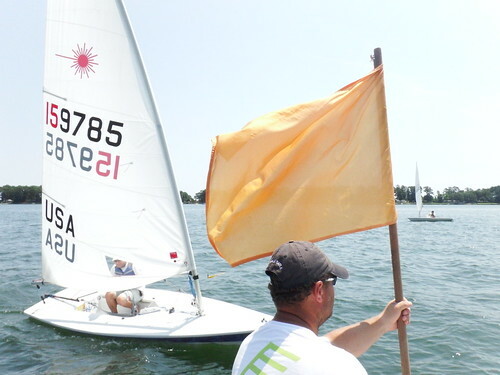 I’ll be Laser sailing the next 3 weekends and should be ready by then for the District 11 Championship at Tred Avon August 23-24. 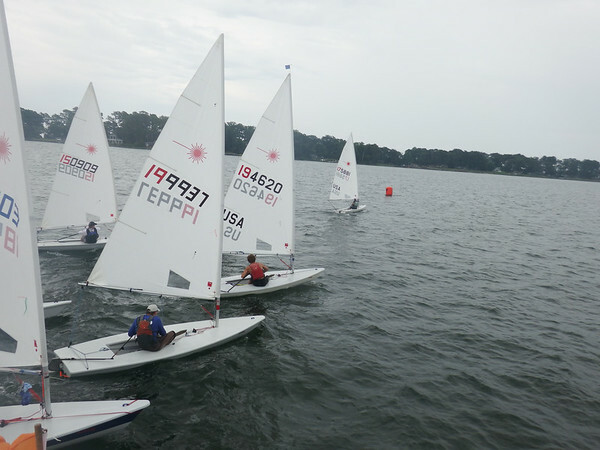 The wind started out light for the 8 Lasers at the Fishing Bay Yacht Club Summer Laser Regatta. We sailed 2 races in light air and then waited a short time for the sea breeze to kick in and gave us a little more solid pressure for another 4 races. I got a great jump on the first race and lead wire-to-wire. Other highlights include several 2nds including a couple races where I had to claw my way up there from 4-5 at the first windward mark. I ended up 2nd overall. Len Guenther was fast and consistent and put up 3 bullets to win the day comfortably. Blake Kimbrough was a fast starter all day – too fast – he was OCS in 5 of 6 races and in the only race he wasn’t OCS he won. Despite the restarts he still sailed fast enough to take 3rd overall. 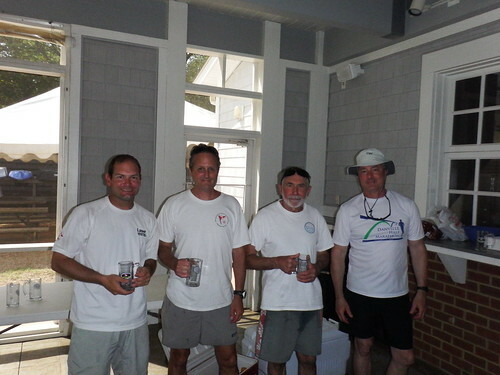 The rest of the fleet – Brad, Mike, Rob, Frank, Alain all sailed good races and kept it close and competitive all the way around the course. Thanks to Tom, Paul and the rest of the race committee for running races for us. And thanks Lisa Radtke for a few photos.